When I look back at 2014, I tend to focus on the video games that I have played or the news that might influence the evolution of the Xbox One or the PlayStation 4 in the coming years, but for a growing audience the past 12 months were the moment when Twitch video streaming has become more important than actually playing. At the moment, there are personalities who broadcast their activity on the service and have massive audiences, but there’s also space for players who want to simply show how they experience their favorite titles. Twitch is fast becoming a better way to evaluate a game than reading a classic review and major publishers are working to sponsor the channels with the biggest audience, while producing their own streams to show off features of upcoming releases. Valve surprised a lot of people when it announced that it was adding a Broadcasting feature to Steam, its dominating digital distribution service. The concept is more limited than that of Twitch but it can be used to stream video game content (and more) to a smaller audience which is made up of friends. Valve has not announced any plans to expand Broadcasting in 2015 in any major way but gamers can expect to see it play a major role in upcoming DOTA 2 tournaments or other Valve events. The common view is that, at one point, Steam Broadcasting will become a true rival for Twitch and that the two services will compete for a while, trying to introduce new features and to increase their audiences, before one of them becomes a footnote in the history of video games. But I suspect that Valve is not aiming to create a solution for mass streaming but rather a way for smaller circles of friends to show each other gameplay and to comment on it. Twitch seems to be focused on big audiences at the moment and the Steam feature can become important if it manages to become relevant for smaller groups, giving them easy-to-use tools to create content and to then share it. The two can co-exist and the only downside is that a growing number of gamers will continue to watch rather than play in the coming year. Just like Steam’s tagging functionality, which initially had undesirable results, it’s going to take some time for Valve to get Steam Broadcasting right, which may include protecting itself from legal repercussions (and I can’t imagine the complexity involved in doing so). For that reason and more, cries of “Twitch is dead” are massively premature. I’m not even sure Valve is gunning for the current leader in livestreaming, and after playing with the beta release today, I don’t think it’s any competition yet. I do like it, but it offers something different—an easy way to share with friends. And Valve does have advantages. When I want to Stream on Twitch, I set up OBS, test it, then tell everyone on Twitter that it’s happening and hope for some viewers. On Steam, which already houses most of the games I play, I just set it up once and play any game in my library. The streams are a good quality (mostly), and I haven’t had performance problems while playing. My biggest fear is that I’ll forget I’ve set my streams public because it works so smoothly. If I do decide to let anyone watch, any game I’m playing on Steam, I will be posted as a broadcast in the game’s community hub. 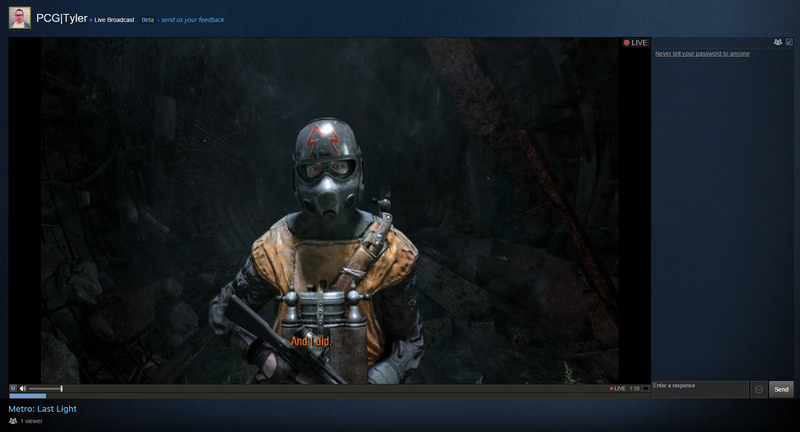 A couple minutes after I started streaming Metro: Last Light—not exactly a brand new game—three viewers showed up, and all I was doing, was sitting at the menu. Steam offers a massive audience, so I expect popular games and streams to draw a lot of attention. It could be huge. You currently need to be logged into Steam to view broadcasts, and they can’t be embedded on other websites. Some of this may change in later releases, and it’s possible that big Dota 2 and CS: GO tourneys will feel cozier on Steam (where Valve could potentially sell access), but we’ll just have to see where that goes. For the moment, I don’t see Steam as a competitor to Twitch, which isn’t to say Twitch is the best possible service; it’s just different. Steam Broadcasting is a service for Steam’s community, while Twitch is a business opportunity and e-sports hub. If I were running a tournament, I’d use Twitch, but if I want to share a game with friends, I’ll probably use Steam starting now. I could notice Evan playing CS: GO, and decide I want to absorb some of his skill. He could notice me playing some new Early Access game, and find out what I think of it. It’s easy, too. With the latest beta client installed (you can set that up in Steam’s preferences), all you have to do, is right click a friend’s name and hit “Watch game.” Depending on their settings, it’ll either send you to the stream, or let them choose whether or not to share (it can also be set to invite-only, so that you don’t have to opt out of requests). I’m going to prefer privacy most of the time, but I’d happily run around Far Cry 4 with an audience of friends. It would feel like a hassle to start a Twitch stream just to show Evan how much C4 I stuck to an elephant (and I wouldn’t have bothered), but if he’s already in Steam all he has to do, is ask. That’s the real value of Steam Broadcasting for me. If Valve gets aggressive next year, we could see certain tournaments and big streamers switch over, but right now, I don’t think Valve is taking on Twitch. (In fact, I’ve seen many users suggest adding Twitch support.) And anyway, I hear that League of Legends, Hearthstone, World of Warcraft, StarCraft II, and Minecraft are pretty big despite their non-inclusion in Steam. It’s apparently possible to use Steam to broadcast non-Steam games, but why would you?